Downtown Columbus Ohio has an energy and vibe entirely its own, and Flowerama has been delivering Flowers, Roses and Fresh Flower Arrangements to downtown Columbus area since 1990. Want your gift delivered the same day? We can do that. Need it delivered to Downtown Columbus even faster? Check out our express delivery options at check out. We are locally owned and operated and have four locations throughout Columbus Ohio. 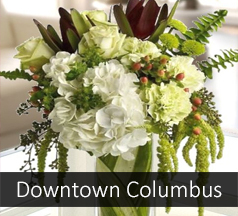 We also provide daily flower delivery to Downtown Columbus businesses, Downtown Columbus funeral homes,Downtown Columbus schools, Downtown Columbus hospitals, and Downtown Columbus nursing homes.